Sub: Revision of Kilometrage rates and other Allowances of Running Staff - Summary Record note of discussions held on 04th and 05th January 2018-reg. Ref: (i) Railway Board’s file No. E (P&A) II/2013/RS-14. (ii) NFIR’s letter No. IV/RSAC/Conf./Part IX dated 12/01/2018 to Secretary, Railway Board, copy endorsed to EDPC-I and ED (IR), Railway Board. II. In the light of the Government’s decision to decide revision of rates of kilometrage Allowance and other related Allowances of the Running Staff through bilateral discussions between the Federations and Railway Ministry, it needs to be appreciated that the bilateral negotiated settlement is required to be worked out taking into account various factors relating to working conditions of Running Staff, Risks involved and their abnormal nature of duties. In this connection, NFIR invites Railway Board’s attention to Para 28 of IInd CPC, Para 187 of IIIrd CPC, Para 104.56 of IVth CPC and Para 133.40 of Vth CPC with regard to pay element and revision of Running Allowance rates. Ashruff Committee (1968) and Running Allowance Committee (1980) had also clearly stated that the actual measure of the efficiency of performance is the “Running Allowance” which should motivate Running Staff and act as an incentive for over all improved performance. ii) The second method would be to determine the pay element on the basis of average earnings of the Running Staff”. “In the first method, the scales of pay, which, it can be reasonably assumed, would have been allotted to the running staff had the running allowance scheme not been in vogue at all, is taken as the “Notional Scales”. The difference in the mean of the existing scales and that of the notional scales expressed as a percentage of the mean of the existing scales would represent their percentage which their pay element can be treated as bearing to the basic pay of the running staff. The committee requested the Railway administrations as well as the Organised labour during discussion with them, to suggest the notional scales which should be adopted for this purpose. Taking into account the suggestion received in this regard, the committee considers that for this purpose it would be fair by and large to proceed on the assumption that but for the existence of the Running Allowance Scheme, the highest grade of the Drivers (Driver A Special) would have been allotted the scale of pay, immediately below the grade applicable to Supervisor namely Loco Foremen A (Rs. 840-1040) to whom they report. Accordingly the scale of pay which would have been allotted to Drivers grade A Special, but for the existence of the Running Allowance Scheme can fairly be assumed to be Rs. 700-900 (RS). On the other hand, the organized labour had put forward the view point that the notional scale or the highest grade of Driver should be assumed to be atleast the same as to be the highest scale of pay admissible to the generality of non-running staff. In other words, it is their contention that the scale of pay to be assumed for this purpose should be atleast Rs. 840-1040 in the case of Drivers A special. The committee would like to clarify here that the scales under discussion are purely notional and they are intended to only provide a basis for the determination of Pay Element. The committee considers that a liberal approach in this regard is called for. Accordingly it would not be inappropriate to assume for this limited purpose only, that the notional scales of pay for Driver Grade A Special should be Rs.840-1040 and that applicable to Guard A special grade immediately lower than the above viz. Rs.700-900. The notional scales for the other Grades of Drivers and Guards should be correspondingly lower. On this basis the percentage of pay element worked out in the manner outlined above in the case of Drivers Grade C and Guards Grade C could, in the opinion of the committee, be taken as indicative of the range in which the Pay element lies. The percentage in the case of Grade C have to be taken for this purpose as in the last revision in the rates of the allowance, the calculation in the rates of Running Allowance in the case of Grade C Drivers and Grade C Guards was made the base for determining the rates of running allowance applicable to other categories of Guards and Drivers. The percentage of the pay element determined in the manner works out to 27 for Drivers Grade C and 20 for Guards Grade C”. “In the second method, the pay element is sought to be derived by deducting from the average running allowance, travelling allowance for 25 days, the balance being treated as representing the pay element (TA for 25 days is taken as that was the basis adopted in revising the rates of running allowance during the past decade). This balance expressed as a percentage of the mean of the relevant scale of pay can be taken as the percentage of pay element. Here again, for the reasons explained above, the percentages thus worked out for Grade C Drivers and Grade C Guards may be taken as indicative of the percentage of pay element for running staff in general. Adopting this method, it is seen that the percentage of pay element works out to 28 in the case of Drivers Grade C and 13 in the case of Guards Grade C”. 712: “Application of the same method to the scales of pay and average running allowance obtaining in the prescribed scales of pay immediately before introduction of the authorized scales and in the authorized scales of pay immediately after introduction of revised scales yields a figure of 32% and 30% respectively as the pay element in the case of Drivers Grade C and Nil and 19% respectively in the case of Guards Grade C”. “As a further exercise to determine the range of pay element, samples of figures of running allowance actually earned by Drivers Grade C and Guards Grade C. over a period of one year have been taken and the TA that would have acquired to the staff considered under the TA rules applicable to the non-running staff, have been deducted there from, treating the balance as pay element. The balance expressed as a percentage of the basic pay of the individual drivers and Guards Grade C concerned, has been taken as the percentage of pay element in each case. The average (mode) of the figures thus arrived at works out to about 30% in case of Drivers Gr. C and 23% in the case of Guards Gr. C”. 714 : NO ADDITION NEED BE MADE TOWARDS INCENTIVES. “It will be seen from the fore going that the percentage of basic pay which can be treated as the pay element varies from 0 to 32, but mostly it falls in the range of 20 to 30. In this context, the committee considers that there is merit in the suggestion that the percentage, viz. 30, laid down in the letter dated 15/06/1979 of the Ministry of Railways (cited in para 708 above) should be taken as the guiding factor. As regards the further suggestion that an addition should be made to the said 30% towards "the incentive element in the running allowance, it is to be noted that for the reasons explained in chapter VIII dealing with the determination of the rates of running allowance, the committee considers that the incentive part of the scheme should be kept outside the structure of the rates of running allowance and not built into the rates themselves. Accordingly, the committee is of the opinion that no addition need be made on this account”. 715 : COMMITTEE RECOMMENDS 30% OF BASIC PAY AS PAY ELEMENT. c) Except where the circumstances justify a different treatment, the said 30 percentage should be treated as pay for the purpose for which running allowance is to be reckoned as pay. NFIR had strongly pleaded before RAC 1980 for 40% Pay element, taking incentive factor also into consideration to compensate for the unnatural type of work such as stress, strain, loss of sleep, absence from head quarters, dislocation of family life, unhygienic working conditions/atmosphere, adverse effect of noise and vibrations and other job related problems risks of Running Staff. Sadly, however, the pleading was not conceded, probably with a View, that such an increase will disturb the relativities in pay and pension of Loco Running Staff with that of other supervisory staff. On the said ground only, a decision was taken to prescribe 30% as Pay element. It is worth-noting that the recommended 30% pay element for various purposes falls under clause 3 of Rule 2003 of R-II under the clause “other emoluments” classified by the President. From this, it could be seen that the pay element was not decided on the depreciation factor. The difference in the mean of the scale of Driver A (Passenger Driver) and that of the notional scales expressed as a percentage of the mean of the existing scale of Driver A could have been the “Pay element”. Mean of Notional Scale of Rs.840 - 1040 was Rs.940. Mean of Pay Scale of Driver A (IV CPC) Rs. 550-750 was Rs.650. Therefore, Pay element should have been 940-650 = (290/650) x100 = 44.61%. However, pay element was identified as 30% only instead of 44.61%. Moreover, at present, the Loco Pilots are in L6 of the 7th CPC pay with a pay matrix of Rs 35400-112400, and the mean pay works out to (35400+112400)/2=73900. The Apex scale of Group ‘C’ of non-running staff, is in L9 of the pay matrix of Rs 53100-167800 and their mean pay is 110450. This is the exact position of the depression factor in VII CPC pay matrix. This is the basis of the submissions made by the Federation, that the depression factor is presently at 50% (as seen in Para 2.2 of the Summary record note of discussions), basing its demand on the highest group ‘C’ VIth CPC Grade Pay of Rs.5400 ( L9 of 7th CPC Pay Matrix). Hence, it can be adduced that the measure of depression, at present, stands at 50% and not at ‘minus 13%' as claimed by the Official side . “On account of more onerous nature of work as well as process of selection involved, Loco Pilots for passenger trains shall be given an additional allowance of Rs.500 p.m. Loco Pilot for mail/express trains will be given this allowance at the rate of Rs.1000 p.m. Dearness allowance shall be payable on this allowance. The existing parity with cadre of Guards, for other allowances like running allowance, may also be retained in respect of this allowance which is being recommended for the first time (Refer Para 7.36.50 of 6th CPC report)”. However, this was continued as an allowance and ' not as Pay, despite several representations by NFIR. This subject is also figuring in the PNM agenda, but Railway Ministry has not been able to get clearance from MoF, inspite of several reminders. If a higher Grade Pay would have been allotted to LP/ Passenger & LP/ Mail, their in-service as well as retirements, would have been reasonably compensated and this small consolation given by 6th CPC, has not translated into a meaningful benefit, even after passage of 12 years. For most of the allowances that have been retained, we have sought to provide a raise that is commensurate with the rise in DA. Accordingly allowances that are in the nature of a fixed amount but not DA indexed have generally been raised by a factor of 2.25. Allowances that are in the nature of a fixed amount but are partially indexed to DA have generally been raised by a factor of 1.5. Allowances that are in the nature of a fixed amount but fully indexed to DA have not been given any raise. Regarding percentage based allowances, having regard to the increase in the pay structure (and consequently the Basic pay) as a result of the recommendations of this commission, and keeping in mind the rise granted to slab based allowances, the quantum of percentage based allowances has been rationalized by a factor of 0.8"
A clear reading of this recommendation of 7th CPC, which was accepted by Government, reveals that the rationalization by the said factor applies only for Allowances. Whereas the Pay element to Running Staff is 'Pay' as defined by the Rule 1303-FR-921(a)(iii) and the same is specially classified as ‘Pay’ by the President. Therefore, the attempt for applying the rationalization factor of 0.8 on Pay element is totally incorrect and violation of codal provision. The KMA rate consists of two components, one is Pay portion, i.e. the Pay element and other is TA portion. As already spelt out, the VII CPC recommendation is to rationalize only the allowances with the recommended factor. As long as one of the components in Running Allowance is “Pay”, any rationalization by a factor is totally wrong. It is also a known fact that the other component in Running Allowance is the TA portion. A plain reading of paras 8.15.12 to 8.15.16 of the VII CPC report reveals that the enhancement of DA/TA rates recommended by the VII CPC has not been done with any factor. Evidently, for all other allowances, the VII CPC specifically stated the factor, which is required to be applied to increase the rates, but not for TA/DA. VI. 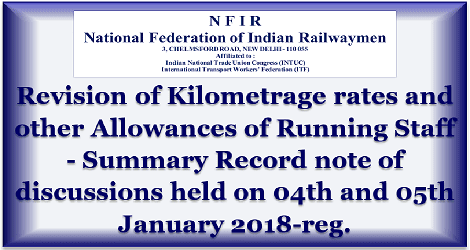 NF IR reiterates that in any case, the 7th CPC as well the Government have left this issue to the Railway Ministry to discuss with the Federations for reaching an agreement for revision of Kilometrage Allowance rates, therefore the 7th CPC recommendation to multiply with 1.5 or 2.25 is not at all relevant, so far as Running Staff Kilometrage Allowance rates are concerned. The observation of the VIIth CPC in para 8.2.5.5, that “ There are, however, exceptions to the above approach (rationalization factor)”, strengthens NF IR’s contention. This very observation, by itself, gives a free hand to the Railway Ministry to decide for upward revision of rates of Running Staff Allowances, through bi-lateral discussions and agreements thereon. The Joint Committee on Running Allowances, 2008 recommended two rates of running allowance, first from 01-01-2006 since Kilometreage allowance contains a pay element and thereafter from 01-09-2008, when the revised TA/DA rates were implemented (Refer Para 13 of the report).But the Railway Board, while revising the Kilometreage rates, pursuant to implementation of the 6 CPC pay scales, did not take this into account and KMA rates were not revised with effect from 1.1.2016 unlike that of revisions made while implementing revised pay scales of previous pay commissions. Continued representations from “NFIR and discussion in DC/JCM & in the Joint Committee constituted to discuss Running Staff issues to correct this historical blunder and revise the KMA rates with effect from 1.1.2006 & thereafter from 1.9.2008, 1.1.2011, 1.1.2014 & so on, has not yielded fruitful result. Had the Running Allowance rate been arrived at, in the year 2008 based on the recommended TA rate of Rs.340, there may be some logic in the argument of Official Side for multiplying the present rate by a factor of 1.5 (as per the VII CPC recommendations) or more precisely by 1.5686. But, subsequently, the TA rate of Rs. 105 (prior to VI CPC), was revised to Rs. 340 and not to Rs. 210 as assumed by the Joint Committee, 2008. The demand of the NFIR had all along been that the rates of KMA should be revised from 1.1.2006 on the implementation of VIth CPC Pay Band and thereafter application of the revised multiplification factor of 3.238 (based on TA revision from Rs.105 to Rs.340), instead of doubling, has also remained unsolved. It is most relevant to appreciate that the TA rates of Rs 340 would reach to Rs 510 on 30.06.17 and not the rate of Rs 210 assumed (while fixing KMA rates for the Running staff on VI CPC Pay Band implementation). Therefore, the percentage of increase has to be calculated from Rs 315 (210, 262.50, 315) to Rs.800, which works out to 2.539 times approximately. Therefore the KMA rates of Rs 253.50 existing as on 30.06.17, needs to be raised by 2.539 times (which works out to Rs.643.60) and accordingly it was suggested to be fixed at Rs.648 with effect from 01.07.17. Equivalent of 6th CPC 19560 = 19560*3.001' = 58699 is equated to 60400 in Pay Level 6. From the facts explained above, it is very clear that the Official Side views are quite contrary to the factual position. The Joint Committee on Running Allowances, 2008 recommended double the rates of Kilometerage Allowances, based on the assumption that the rates of TA would be doubled. But, subsequently, the rate of TA of Rs. 105 existed prior to VI CPC report, was revised to Rs.340 (3.2 times) and not to Rs. 210 as assumed by the Joint Committee, 2008. Immediately realizing this negative situation, NFIR had raised the issue before the Railway Board and demanded review of the the decision of Joint Committee, 2008 for upwardly revising the rates of KMA from 1.1.2006 on the implementation of 6 CPC Pay structure and thereafter from 1.9.2008. The Railway Board did not resolve the issue even after 10 years, though Note sheets were prepared for upward revision and circulated to Federation during discussions. Had the issue been considered and aberrations rectified then, the present impasse would not have arisen. Summing up, NFIR again urges upon the Railway Board to kindly ignore the views of the Official Side and agree with the Federation’s proposal for revising the kilometrage rates to not less than Rs. 648 per 100 kilometres, as already explained vide NFIR’s note attached as Annexure ‘B’ to the Summary record note of discussions. NFIR also suggests that a meeting of the Federations with the CRB, MS, FC be arranged, for the purpose of apprising Federation’s case, in the event of doubts continued to persist, for accepting the rate of Rs. 648/- while continuing 55% and 30% pay element. Copy to the Additional Member (Staff), Railway Board, New Delhi. Copy to the Executive Director/PC-I, Railway Board DFCC Building, Pragati Maidan, Metro Bhavan, New Delhi. Copy to the Executive Director (FE), Railway Board, New Delhi.